A view of the Sea of Okhotsk from Russia's far eastern Magadan region. Loose cargo may have sunk the freighter that disappeared in rough seas in the Far East, shipping industry insiders said Tuesday, while bad weather continued to hamper a broadening rescue operation. But the Russian Union of Seamen rejected the idea that the Amurskaya, which was carrying 700 tons of gold ore, might have been the target of foul play because of its cargo. "One could suggest that the ship's disappearance is somehow linked to the cargo of gold ore it carried, but, as we know, one ton of mineral ore contains two to several hundred grams of pure gold," it said in a statement. 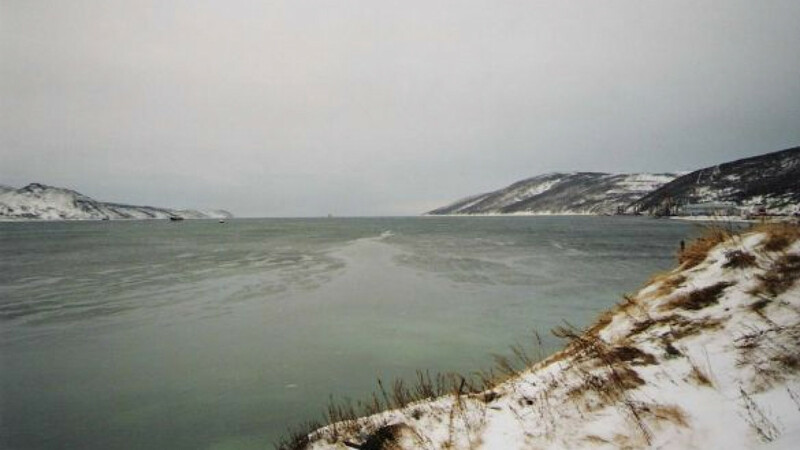 The ship disappeared in the area of the Shantar Islands in the Sea of Okhotsk on Sunday. It might have sunk after its loose cargo shifted in rough seas — unless the crew had managed to find a quiet harbor to wait out the storm, shipping experts told Interfax. Investigators established Tuesday that the freighter had nine people on board when it set off for its last trip, contradicting earlier reports of eight to 11 crew members. They said most of the crew members were Primorye region residents. The scope of the rescue operation Tuesday was limited due to continuing stormy weather in the search area. Only one ship was able to continue the search, while two trawlers and three aircraft remained on standby, Interfax said. Stormy weather was forecast for the next two days. Despite all efforts, no traces of the missing ship or its crew have been found. An emergency beacon that the sailors used to make an initial distress signal has not been found either, Interfax reported, citing the local sea rescue service. It said none of the ships sailing through the area have had any contact with the missing ship.